The need for predictive behavior in any system is one of the key drivers in the IoT Security market. It is estimated that there would be around 50 Billion connected devices by 2020 and all these devices are vulnerable to security threats. The lack of standardization in regulatory framework and, the lack of understand the cost of data theft are the key challenges in the market. It is estimated that the personal data is worth around USD 1 Trillion and most of these data are stored on private servers. It is imperious that the security aspects in IoT should not be an option, because the most unimportant weak link could be the most vulnerable in the entire Network. IoT Security market is not a standalone market, the various market structures are the Internet Service providers, the device providers and the data storage providers. The security providers work with all these stake holders at various levels to ensure that the entire network is infallible. The report Global IoT Security Market focuses on the market for IoT security spending during the period, 2019-2027. The market segmentation in the report is by type, by industries and by region. The sub segments by type are Cloud, Endpoint, Network, Application and Others IoT Security. The Endpoint market is expected to account to more than 30% of the total market, this market refers to the data collection point. The report titled “Global IoT Security- Market and Technology Forecast to 2027” has estimated the Global market around USD 10 Billion and is expected to grow to USD 74 Billion by 2027. The market is expected to grow exponentially at a CAGR of around 25% and the cumulative market during the forecast period is expected to cross USD 300 Billion. The key drivers in the market include the increase in internet users in regions like APAC, this region is led by the increase in internet users in countries like China and India. The other drivers include the increasing threats across the world. Overview and Market Trends: This chapter deals in detailed about the various factors which govern the IoT Security market. The market structure of the IoT market and the market definition have been dealt in detailed. Market Analysis: The chapter deals with the market dynamics in the IoT Security market which are expected to govern the market during the forecast period. This chapter covers the drivers, restraints and challenges in detailed. Apart from the above mentioned, Porter’s Five Forces and the PEST Analysis are also covered in this chapter. 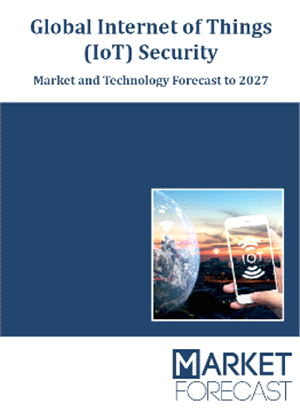 Market Forecast: The forecast period for the report titled “Global IoT Security- Market and Technology Forecast to 2027” is between 2019-2027. The forecast section covers the segment level forecast across type, region and industries. There are 12 sub segments within the industry segmentation, Manufacturing is expected to account to the maximum spent in this market. The forecast chapter also covers the forecast at the sub segment level across the three segments. Opportunity Analysis: This chapter is aimed at mapping the high growth areas across the segments. In case of Region wise segment, APAC is expected to one of the fastest growing markets in the world. The key drivers within APAC is the growth in disposable income. Events Based Forecast: The events based forecast chapter deals with two other possible scenarios based on set of identified factors which could affect the market. There are two scenarios which have been identified based on the possible performance of these factors. Company Profiles: The profiles of major companies in the Global IoT Security Market have been covered in detailed. The report, “Global IoT Security - Market and Technology Forecast to 2027”, covers the IoT Security market across industries, region and type. The report features more than 60+ tables and 130+ figures. The study period of the report is 2017-2027 and the forecast period is 2019- 2027. The report could be of help to any financial institutions who are considering investing into the IoT Security sector. The report would also help new entrants in the market to understand the possible market barriers. The report would also help anyone who is trying to understand the IoT Security Market in detailed and understand the key dynamics in the market. The report could be used as a refence for long term strategic planning by the top management of IoT Security companies. The report would also help the decision makers and the CXO executives to understand the key factors that would impact the overall market size. The report could be of help to investment bankers who are trying to understand the key strengths and Weakness of major players in this. Market.